One of our Jboss production servers runs out of Code cache based on the memory shortage reported when “CompilerThread1” is unable to proceed. I am not claiming at this time that I have understood this issue fully but I have attempted to track the utilization of the non-heap memory pool called ‘Code cache’ which is used to hold JIT compiled code. to dump this at frequent intervals. I have used <code></code> above because the lines are too long. So we don’t see the HTML tags. which holds the JIT compiled code. XPath and Regex to get the current usage data and convert it to MB. Since I know that the data was collected at an interval of 200 seconds I have added a column to the data frame with this data. The collected data does not have a timestamp. The Committed and Used graph lines are together because the data is almost the same. There are some lines of ‘R’ code that are from the forums. In fact some lines related to graph layout may not be required. I always find it difficult to layout the graph. In this case the legend is at the bottom and finding space for it was hard. When I started exploring this aspect of the JVM memory pool I was not aware that one could dump the current memory pool utilization data like this. Kirk Pepperdine(jClarity) pointed out that he has a VisualVM plugin(https://java.net/projects/memorypoolview/) to look at JVM memory pools. My Java Virtual Machine memory pool dump is this. I had earlier isolated only Code Cache memory pool for analysis and that is the following section. I converted this to data frame first. and matches upto the first ‘pipe’ character. "Current Usage : init:2359296, used:13913536, committed:13959168, max:50331648|"
 "Current Usage : init:2359296, used:13915200, committed:13959168, max:50331648|"
 "Current Usage : init:2359296, used:13947712, committed:13991936, max:50331648|"
 "Current Usage : init:2359296, used:13956224, committed:13991936, max:50331648|"
[1,] "Current Usage : init:2359296, used:13913536, committed:13959168, max:50331648|"
[2,] "Current Usage : init:2359296, used:13915200, committed:13959168, max:50331648|"
[3,] "Current Usage : init:2359296, used:13947712, committed:13991936, max:50331648|"
[4,] "Current Usage : init:2359296, used:13956224, committed:13991936, max:50331648|"
[5,] "Current Usage : init:2359296, used:13968832, committed:14024704, max:50331648|"
I drew a graph showing the average memory utilization of a httpd process. I am not claiming that this is a rigorous approach but I get average figures over a period of time. I don’t have time in the axes because it was not needed. data colnames(data) data["Average"] <- "NA"
I am yet to crack the capacity planning method using statistical analysis but I am on my way to that exalted state of expertise. data = input <- readLines(textConnection("
I wanted to draw a graph showing the number of connections made by an IP(Foreign-Address) to our HTTP servers. This is a rough estimate of the concurrent connections. I know I have been smitten by ‘R’ but the power of this language is breathtaking. frequency of values is really powerful. This line finds the count of the same IP’s(group) in the ‘Foreign-Address’ column in the data frame. The source code works perfectly but some of the parameters used to plot the graphs may not be needed. They don’t seem to interfere in any way but it is hard to understand all the parameters of the plotting API. Data in ‘time’ format seems to need a different type of process to plot properly. This code uses strptime to get a proper graph. I have plotted two sets of data on the same plot. This is not visually appealing but serves the purpose. 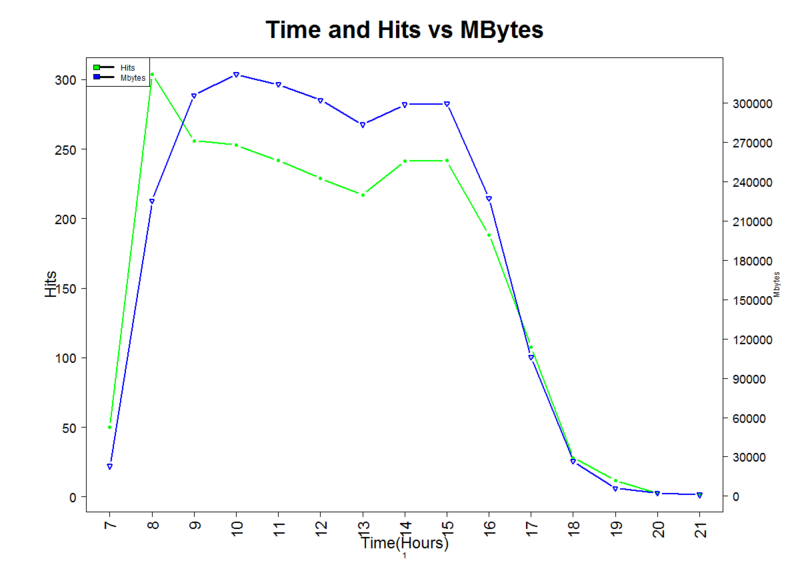 So here the linux ‘pmap’ ouput, ‘Kbytes’ and ‘RSS’ are both plotted against the same time values. The y-axis label colours differentiate the graphs from one another. One problem with this graph is that very few time values are plotted on the x-axis. I don’t know the reason for this but when I asked the ‘R’ forum Jim Holtman suggested this code.